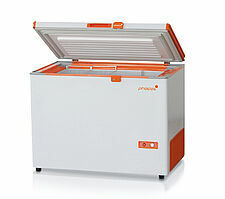 Phocos offers a fridge/freezer unit with 170/240 l capacities. Due to their energy-efficient cooling concept, Phocos fridges are especially suited for solar-powered applications. The top-quality craftsmanship guarantees a long useful life. A 12-cm-thick insulation layer made of polyurethane ensures minimal thermal losses. The refrigeration system is equipped with a maintenance-free, brushless DC compressor. The patented low-frost system reduces the formation of condensation water and ice. A drainage opening at the base simplifies the interior cleaning.